With almost 100 different kinds of boats – from kayaks to canoes to motorboats – there’s a good chance most of us will be having a great time on the water at some point. So when you do, please remember a few simple safety tips for the entire family. Always have your children wear a life jacket approved by the U.S. Coast Guard while on boats, around open bodies of water or when participating in water sports. 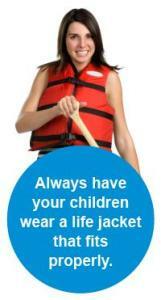 Make sure the life jacket fits snugly. Have the child make a “touchdown” signal by raising both arms straight up; if the life jacket hits the child’s chin or ears, it may be too big or the straps may be too loose. Activities and information produced by the National Safe Boating Council to entertain and educate children on boat safety importance and ways to boat safely. Water safety tips and information on boating, surfing, fishing, water skiing, swimming from the Centers for Disease Control’s Body And Mind Healthy Youth Site. Information on safety in and around the water, on the water, preventing sunburn, skin cancer and heat-related illness. Mission is to prevent drowning and aquatic injuries, by educating, leading, engaging, and supporting the public, and the group’s members, chapters, and partners. Pool Safely: Simple Steps to Save Lives, is the CPSC’s national public education campaign to reduce childhood drownings, submersion injuries and entrapments. This podcast, developed as part of the Protect the Ones You Love initiative, discusses steps parents can take to help protect their children from drowning. Learn about staying safe while swimming at a beach and how to recognize and avoid possible rip currents. Provides tips to stay safe in and near the water, including safe swimming, effective child supervision, evaluating water and weather conditions, protecting skin from the sun. Information from the U.S. Coast Guard on boating safety, including fact sheets.